Young entrepreneurs and business executives presented their experiences relating to EKT support as co-ordinator for Enterprise Europe Network-Hellas and the ‘Knowledge and Partnership Bridges’ initiative in an open dialogue with the public. The successful event ‘Networking and Entrepreneurship’ was held by the National Documentation Centre (EKT) as part of the GRBossible 2018 Festival on Saturday 1st of December 2018, at the Athinais Cultural Centre. During the first session, there were presentations on EKT’s services as co-ordinator of Enterprise Europe Network-Hellas and as a National Contact Point for Horizon 2020, as well as presentations of the initiative implemented by EKT, ‘Knowledge and Partnership Bridges’, which networks and benefits Greeks in Greece and abroad. This was followed by an interesting and interactive discussion with the audience, in which 4 young entrepreneurs and business executives answered critical questions which concern all young entrepreneurs preparing to enter the international market. Among the issues discussed were the international business challenges, networking requirements, international networking, funding needs and local and international opportunities, etc. Konstantinos Papacharalampous, branch Manager of Empist, referred to the decision of the Greek-American founder, John Kampas, to transfer part of business to Greece. He noted that when the right circumstances exist, then the return of those who have left the country is feasible, which is something that is already happening with EMPIST. Alexandros Seimandis, founder and product manager of the UK-based B2B Wave, which provides a flexible ecommerce platform for wholesalers, distributors & manufacturers, explained that he meets daily customers from different countries and nationalities and welcomes the cross-national and cross-cultural sharing of knowledge, not only on a technology level but also in terms of operating procedures and organisational culture. 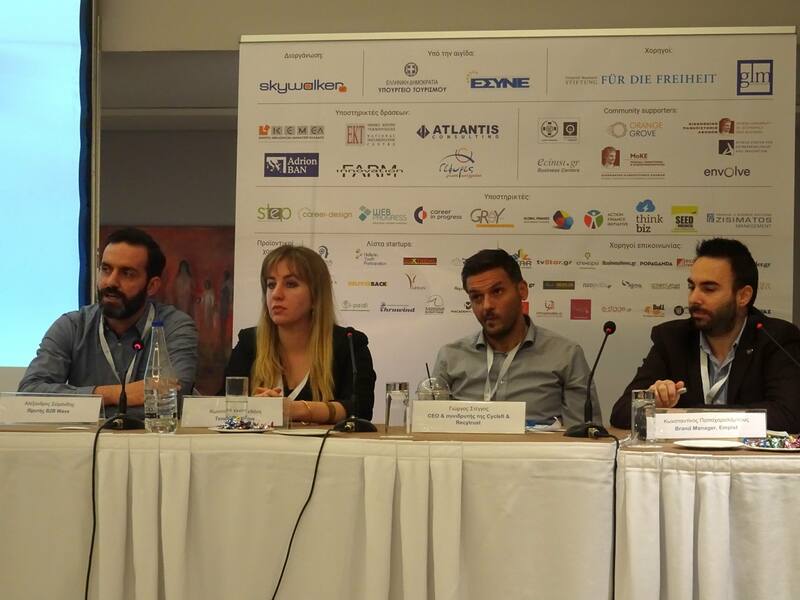 Giorgos Steggos, CEO & co-founder of Cyclefi & Recytrust was next to share his experience. Cyclefi is a Greek Startup which has developed a reliable method of recycling which creates incentives for citizens to increase their levels of recycling on a household level and is preparing to enter the Greek and international market in partnership with a large consumer products company. Having recently received the Smart City award in the Startup Europe Awards, he referred to the importance of a new company to participate in international and national fora and exploiting every development opportunity. Constantina Bethani, founder of Tenebra Studios, talked about the effort she and the co-founder of Tenebra, Thanos Georgoulis, have made to establish videogames as an important part of today’s culture in this country. The two young entrepeneurs want to show that even a country in the middle of a crisis can produce quality and innovative intangible products such as videogames for a global market. The discussion was moderated by Dimitris Maragkos, co-ordinator of the initiative ‘Knowledge and Partnership Bridges’, and George Megas, Innovation and Technology Transfer Advisor, EKT. EKT also implements the ‘Knowledge and Partnership Bridges’ initiative which is based on a plan of the General Secretariat for Strategy and Private Investment, Ministry of Economy and Development. The initiative is directed towards redressing the issue of the new diaspora of Greeks. A means of achieving this is to highlight the advantages that can derive from the networking of Greeks around the world which will have as a consequence the shaping of the country’s future in a tangible way with mutual support on a scientific, professional and business level. The GRBossible festival, was organised, for the 3rd consecutive year, by the Greek website skywalker.gr, with the support of the National Documentation Centre. This year’s meeting of the Greek business ecosystem took place in an open plan space to enable interaction and co-operation between participants and access to information, resources and support services for entrepreneurial ideas. The goal of the festival was to explore the needs, the potential, the opportunities and the decisions relating to the birth of business ideas, the support and promotion of new entrepreneurial initiatives and the updating, networking and physical interaction of all stakeholders in the business ecosystem. The initiative "Knowledge and Partnership Bridges"